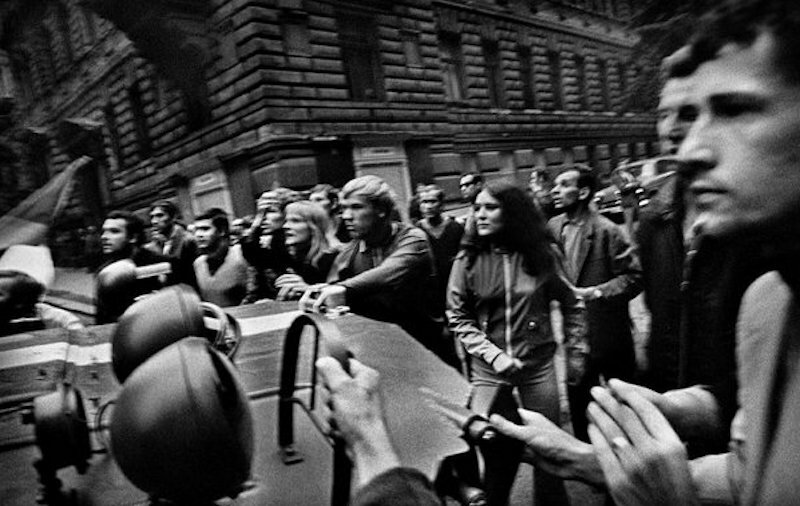 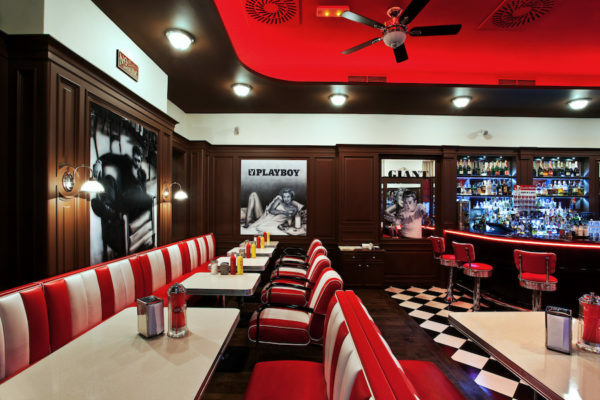 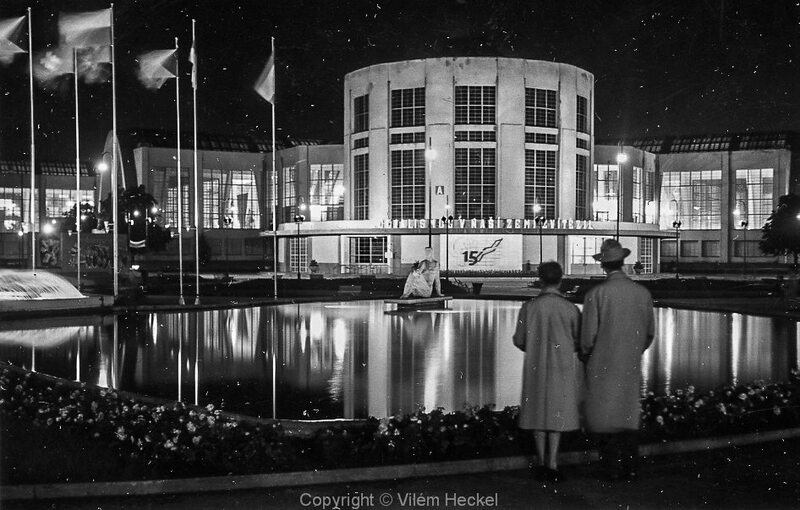 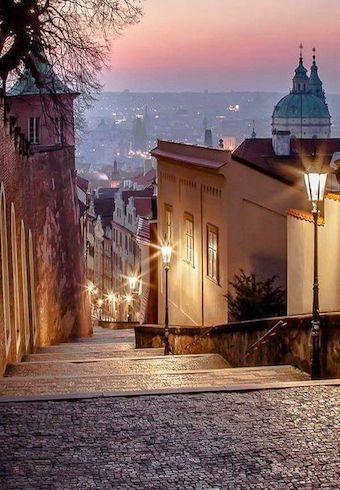 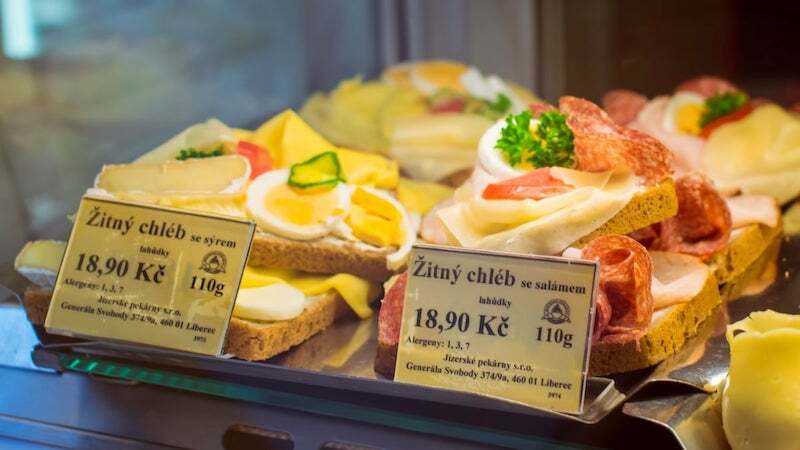 If you have ever visited the Czech Republic, then you surely know about Chlebíčky. 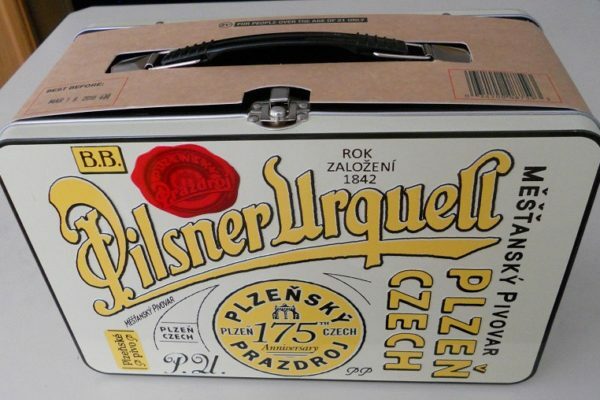 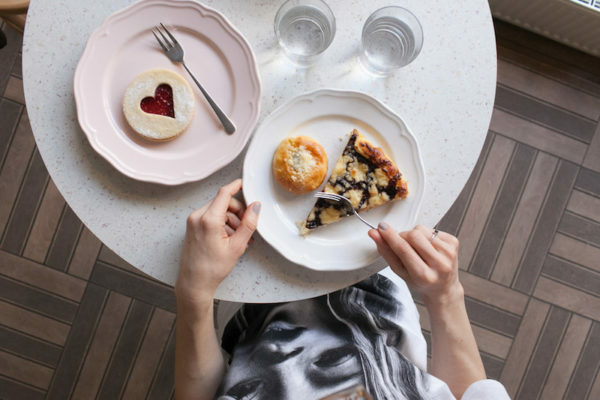 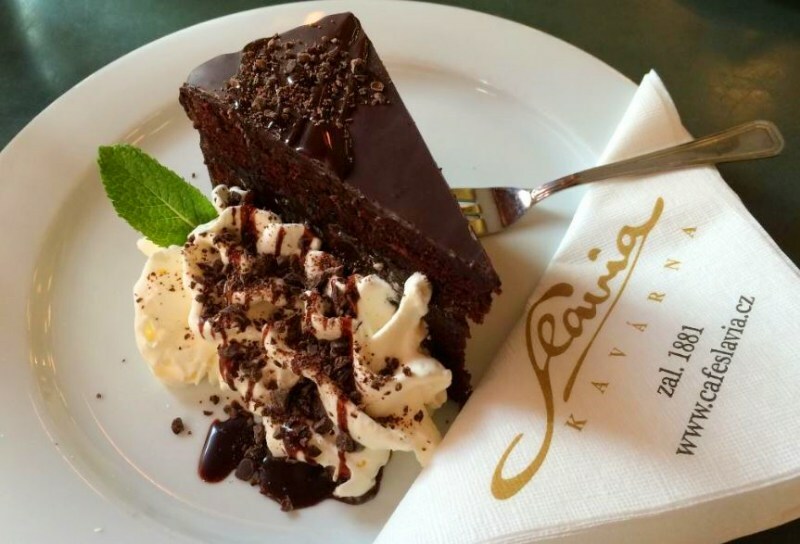 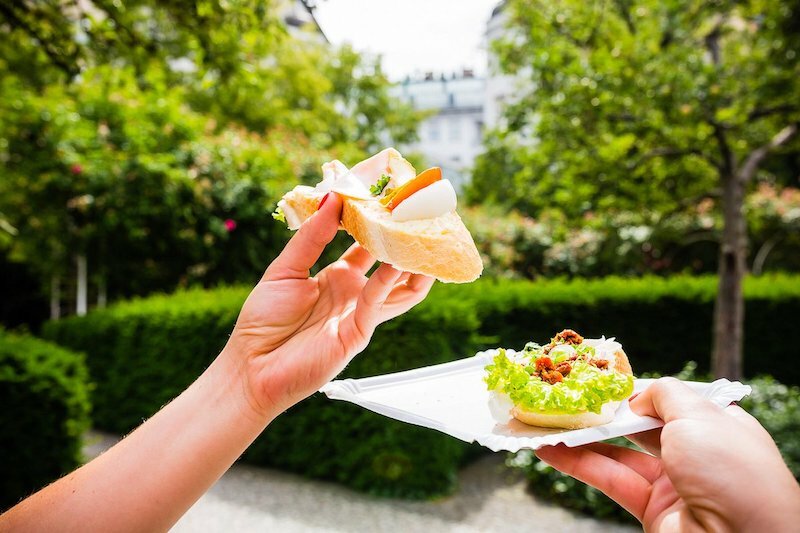 This traditional Czech snack can be spotted on the snack plates set out for company in Czech homes, in the hands of Prague citizens rushing through the city, and in the windows and menus of various Czech bistros, cafés, and restaurants. 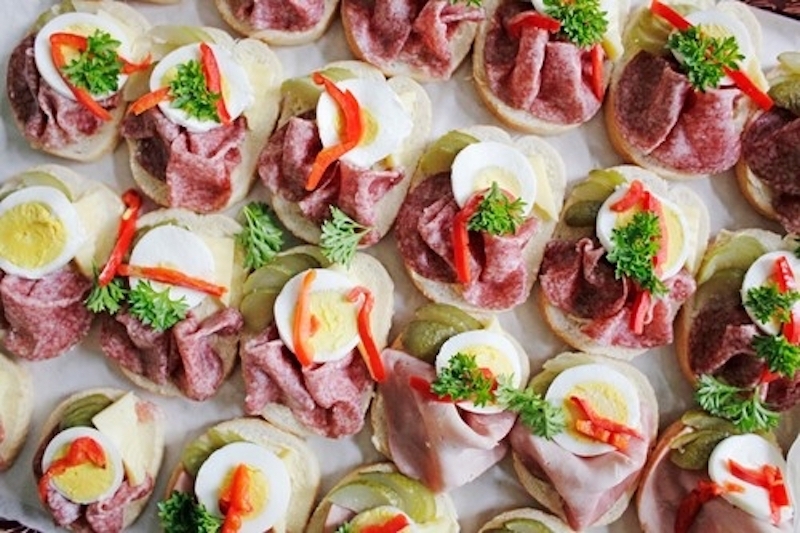 This versatile snack is beloved by the Czech people and by many foreigners who visit, and for very good reason; it is a quick, convenient, and delicious snack on-the-go and an excellent appetizer for parties and special occasions. 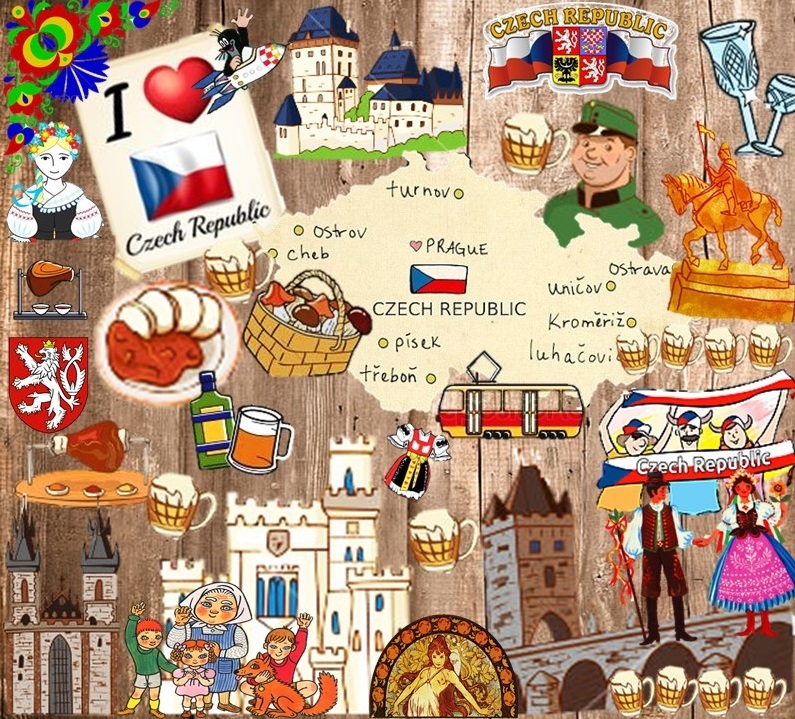 In this post we will explore the history of this classic Czech treat and learn a little bit more about what makes a Chlebíček. 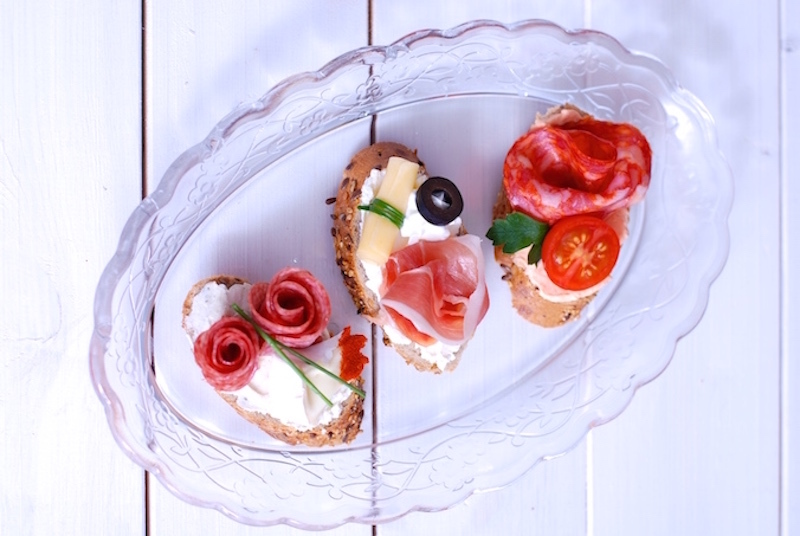 Obložené chlebíčky (English: Garnished Breads) are small open faced sandwiches which are decorated with an abundance of garnishes and embellishments. 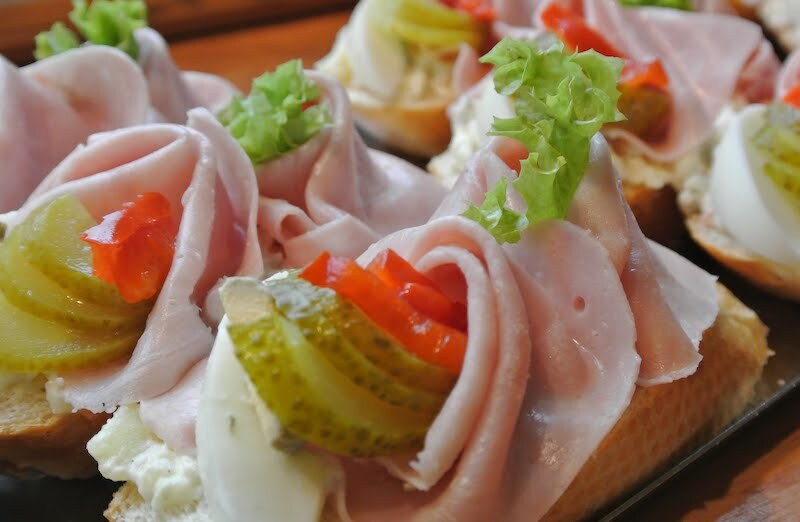 They are incredibly popular throughout the Czech Republic and are often served either as appetizers, snacks, a light lunch or breakfast, or as an Hors d’oeuvre on holidays and at gatherings. 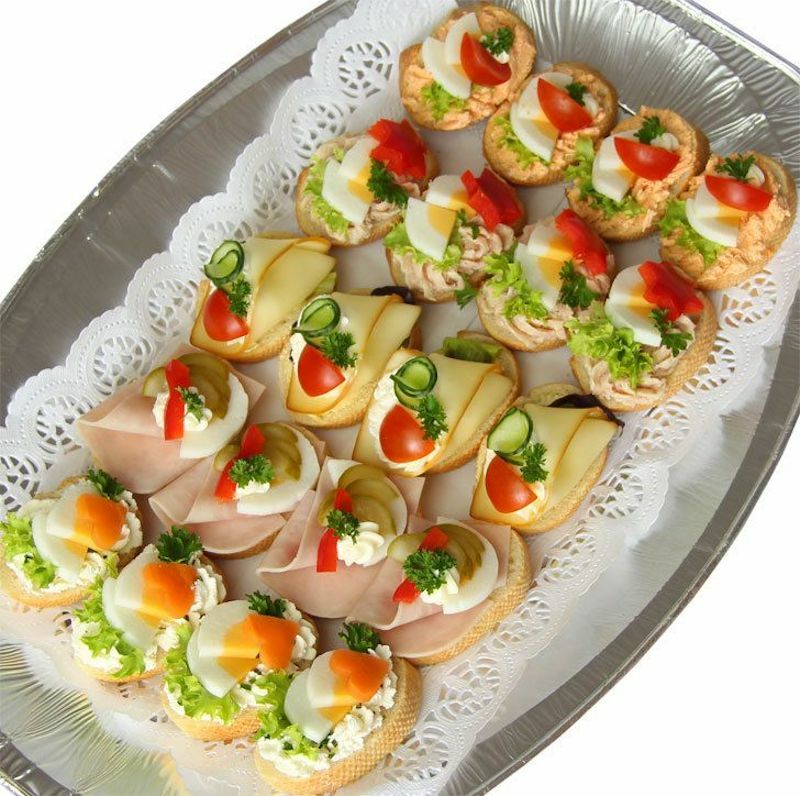 To learn more about the Czech tradition of snack platters, read our post on Czech snack platters. 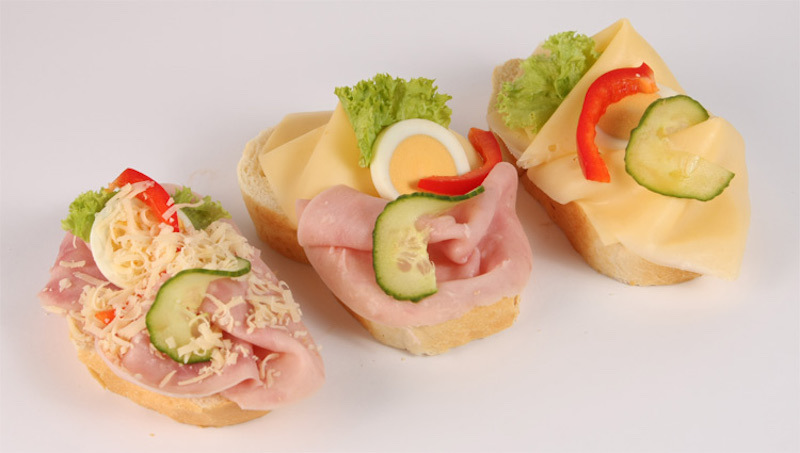 These delicious little sandwiches are usually eaten by hand and, because of their miniature size, can be eaten in three or four bites, making them a popular snack food. 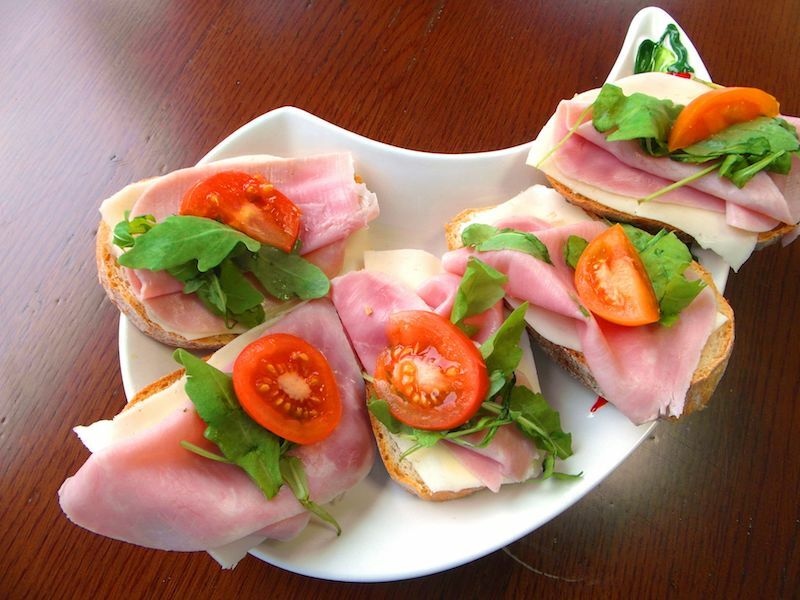 But what is the origin of this delightful snack? 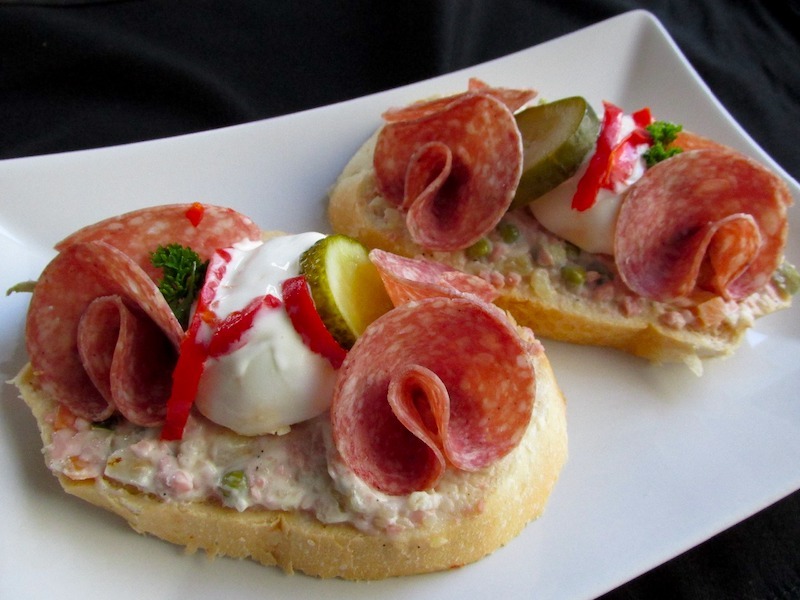 Although open faced sandwiches have been popular in both Central and Eastern Europe since the Middle Ages, classic Czech chlebíčky are thought to have been invented by Jan Paukert in the beginning of the 20th century. 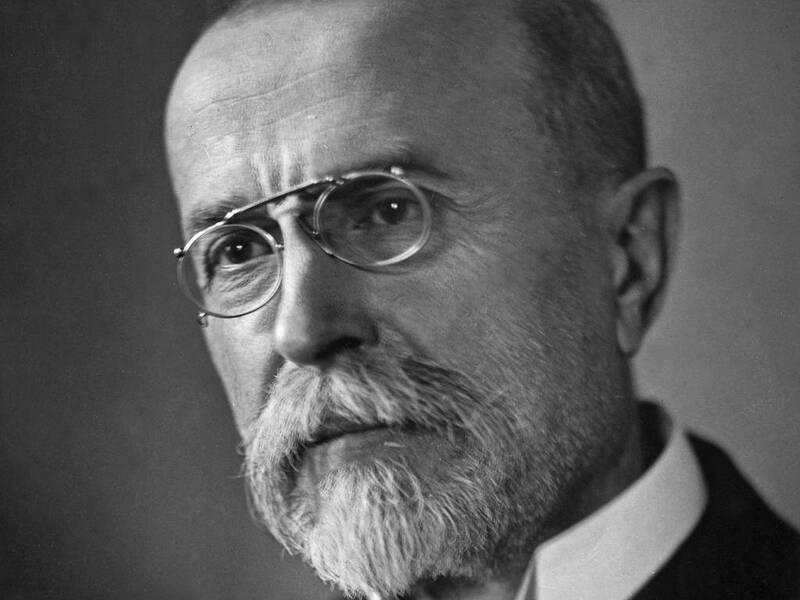 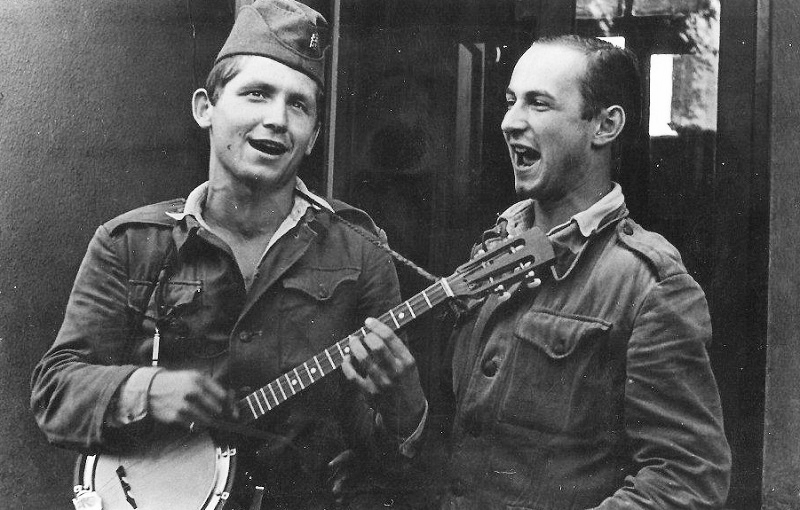 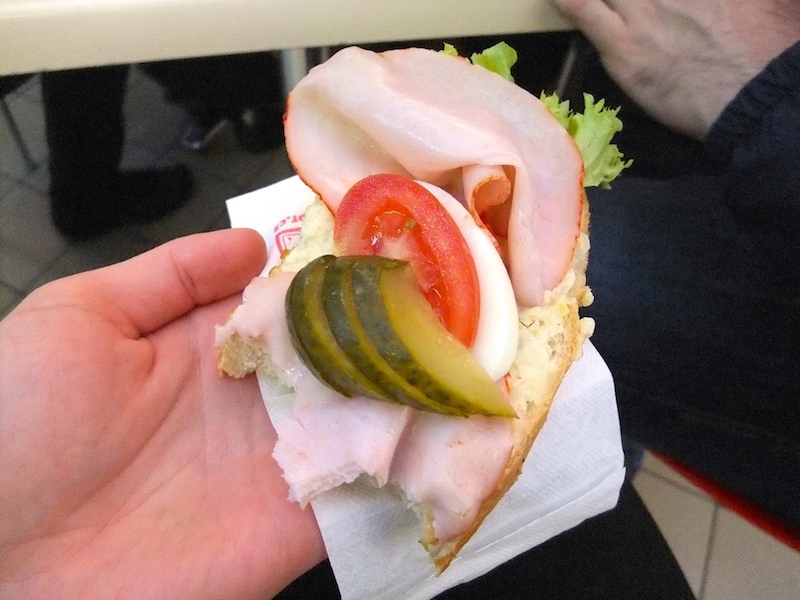 The original Chlebíček, which Paukert served in his deli, was made up of a slice of white bread topped with potato salad, a slice of Prague ham, Emmental cheese, Hungarian salami, a piece of hardboiled egg, and a slice of tomato. 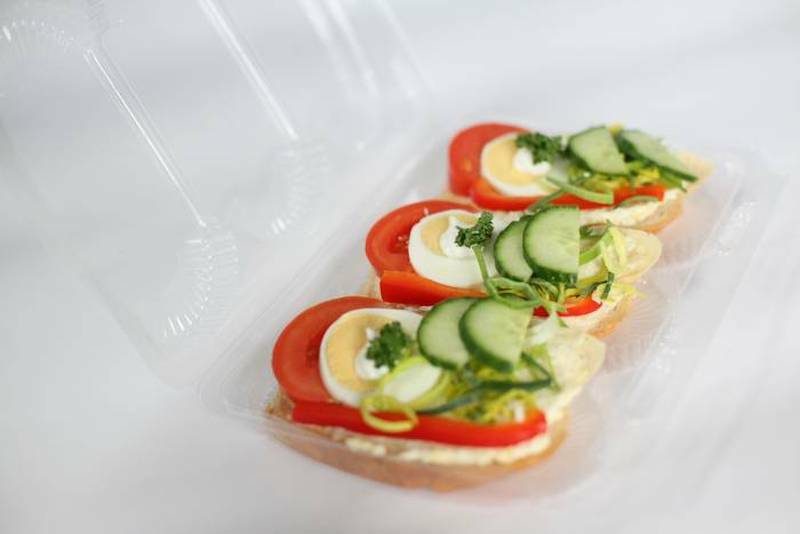 This delightful little sandwich first made its debut in 1916 with the opening of Paukert Deli. 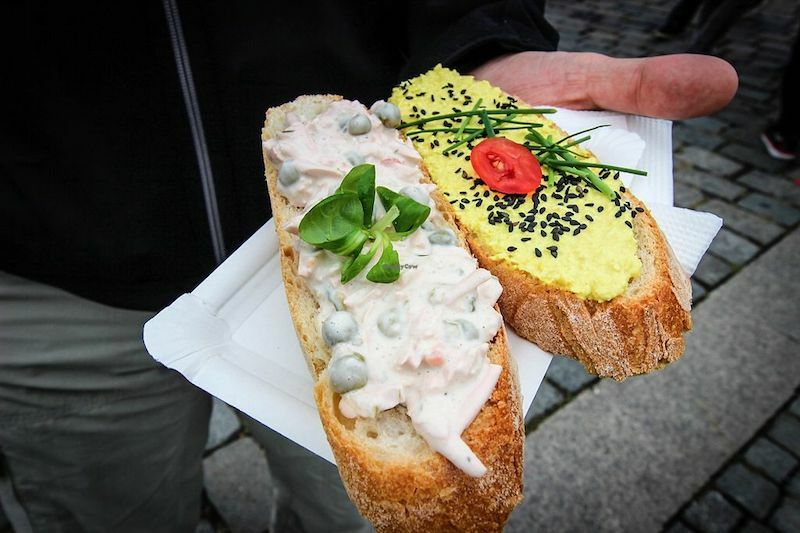 What made the Chlebíček so delicious was the creamy potato salad, which was made with home-made mayonnaise, the recipe for which went to the grave with its creator, Jan Paukert. 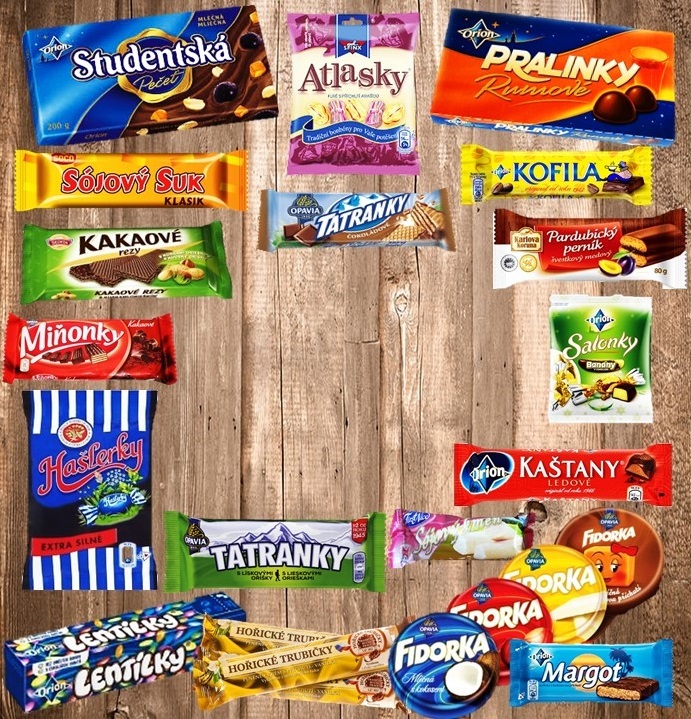 To this day, many variations of obložené chlebíčky can be found in multiple countries surrounding the Czech Republic. 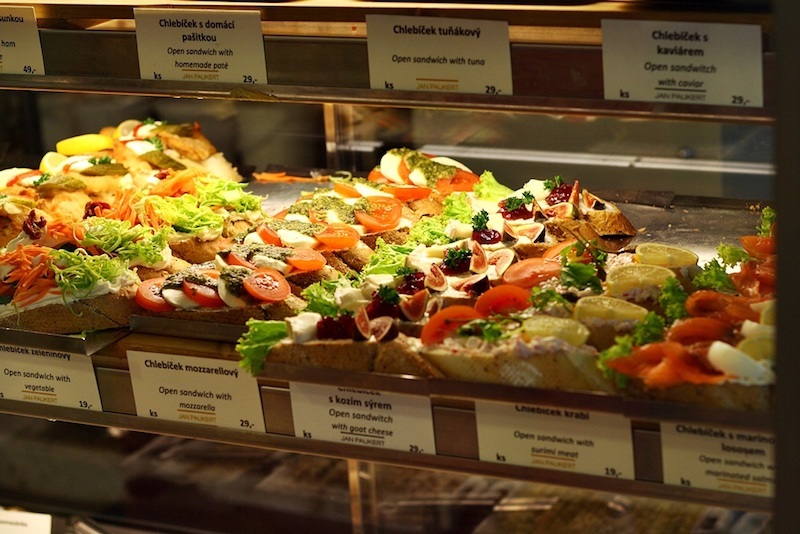 The most popular is perhaps the Scandinavian smørrebrød. 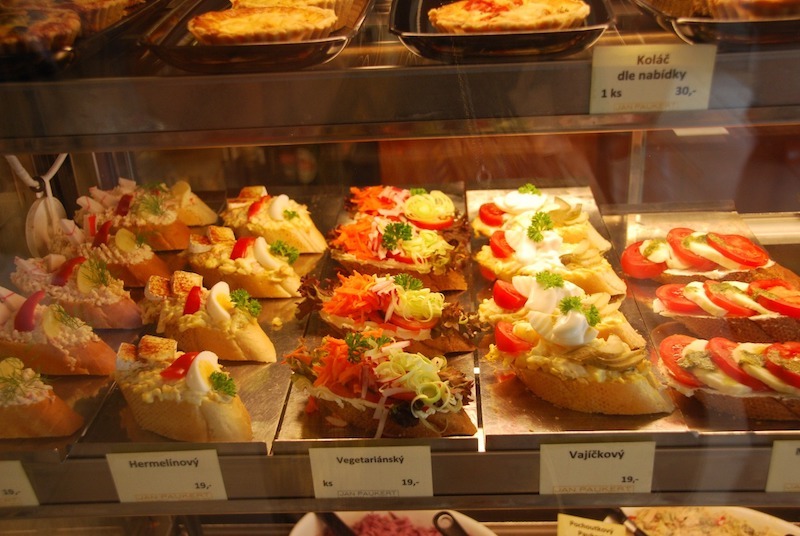 Czech chlebíčky themselves come in a variety of different forms. 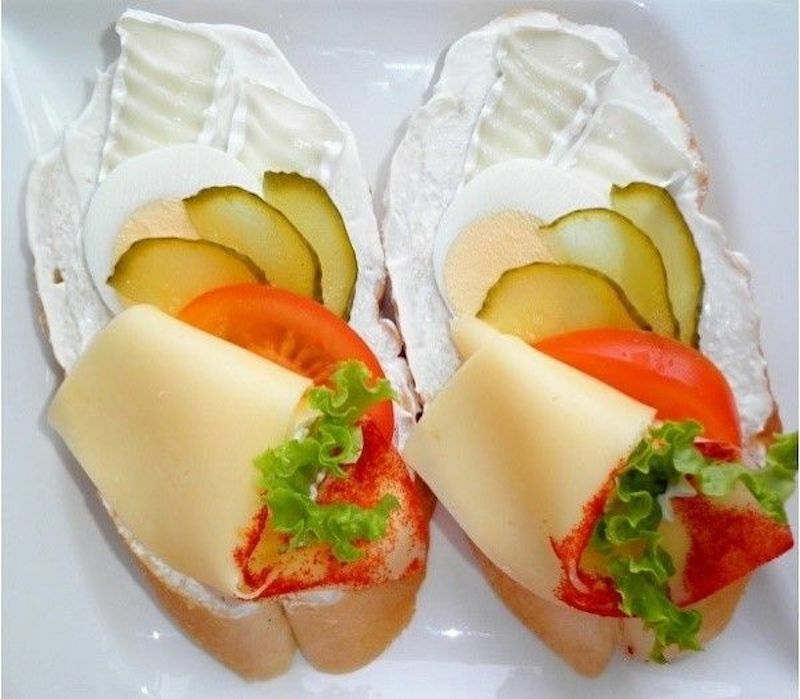 Traditionally, obložené chlebíčky are served on thin slanted slices of Veka (a long and narrow Czech white bread which is similar to a french baguette) and then topped with butter, a spread or mayonnaise salad, and a variety of garnishes including ham, cheese, salami, pickles, tomatoes, onions, smoked fish, or hard boiled eggs. 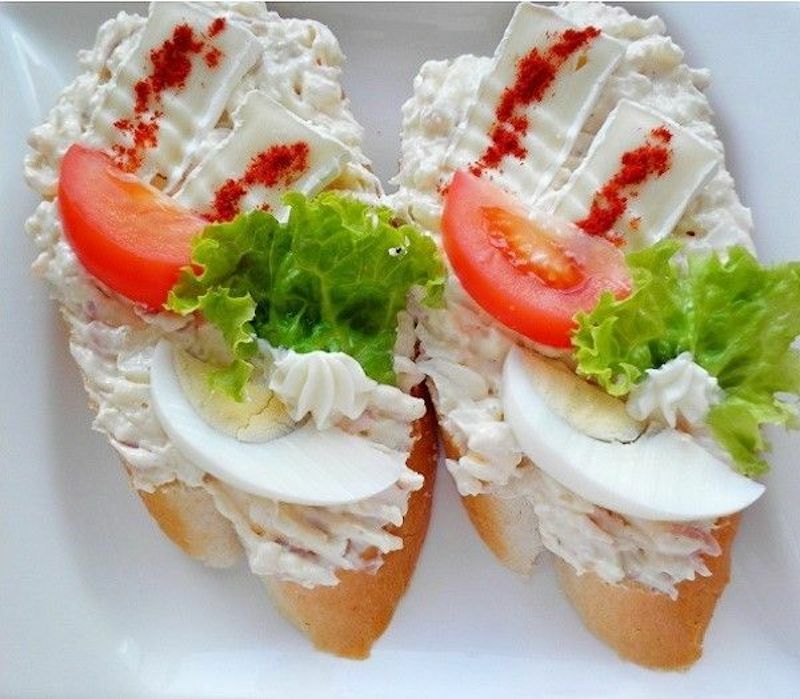 The spreads used on chlebíčky are usually Vlašský salát (perhaps the most popular), egg salad, lobster salad, or a variety of different potato salads. 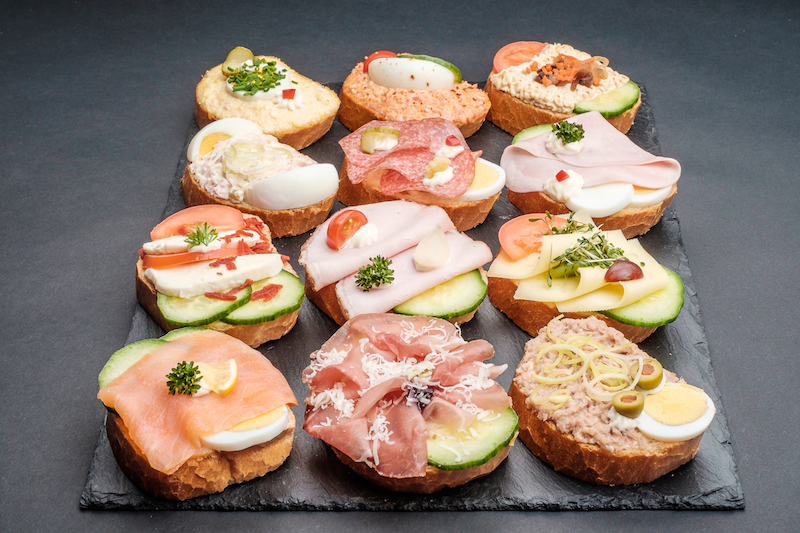 On top of the spread a wide variety of meats, cheeses, and pickled vegetables are then added for color, flavor, and variety. 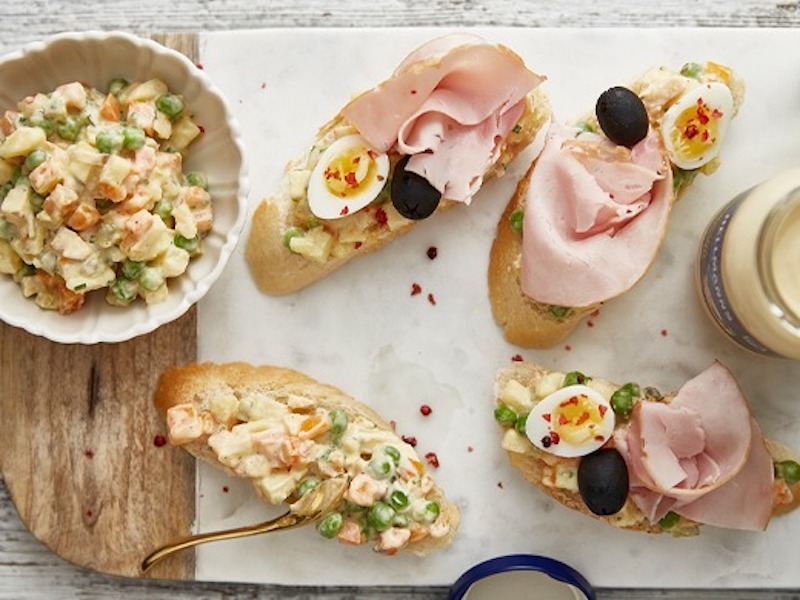 The most popular meats are usually ham and salami, but smoked fish is also a popular choice. 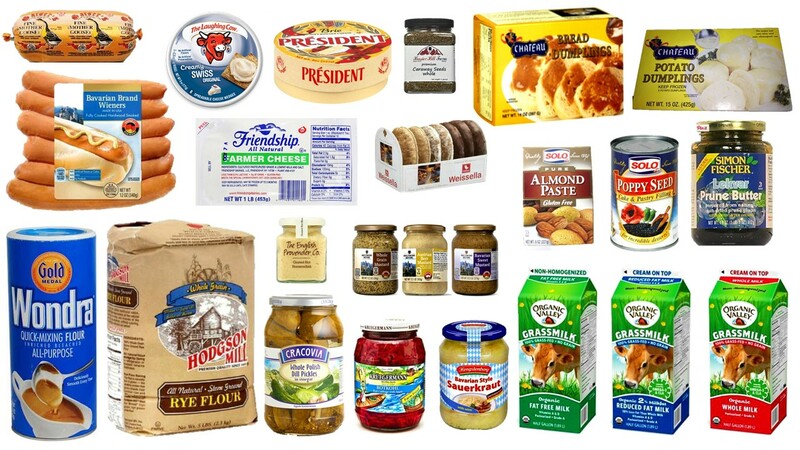 Cheeses commonly include either Edam or Emmental. 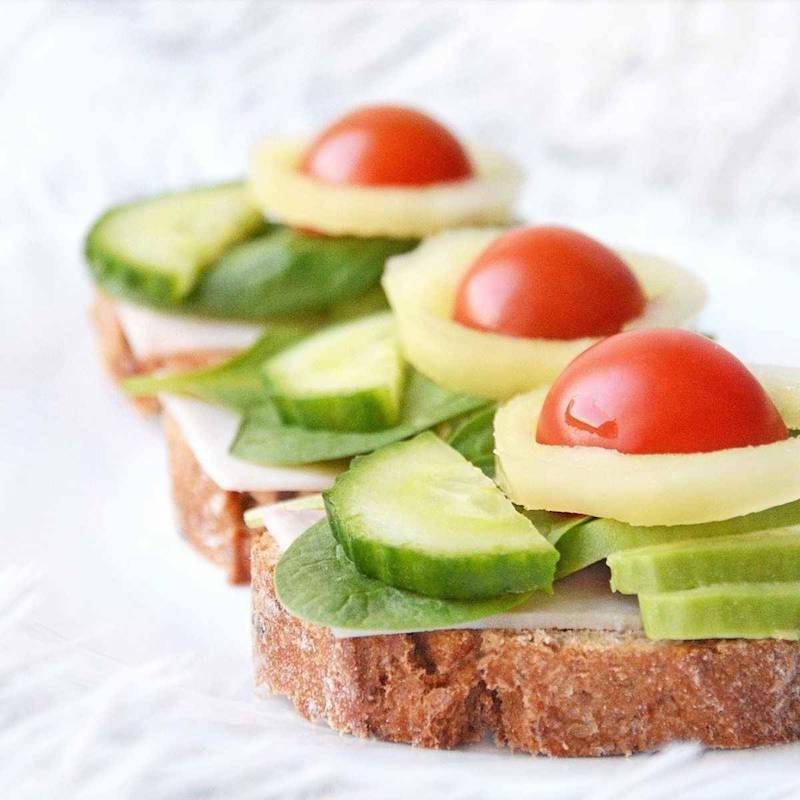 Often slices of fresh vegetables are also used; these include slices of tomato, cucumber, bell pepper, raw onion, radishes, and pickles. 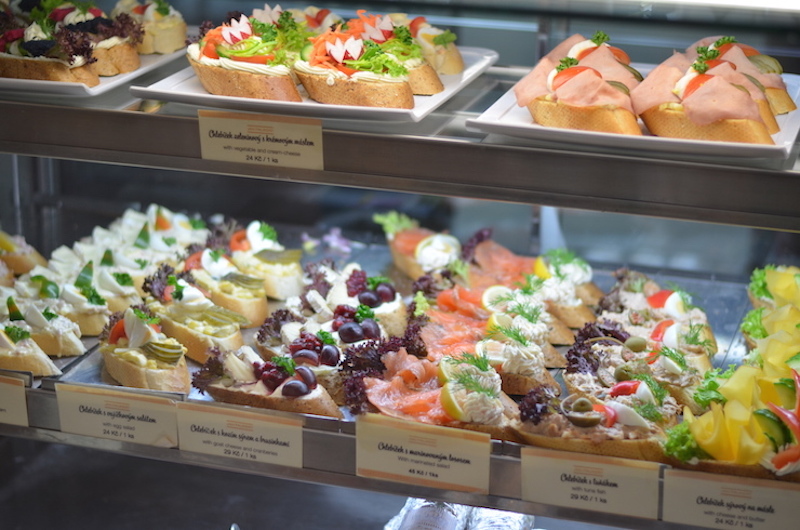 Fresh chives and parsley are also used to enhance the appearance of the open faced sandwiches. 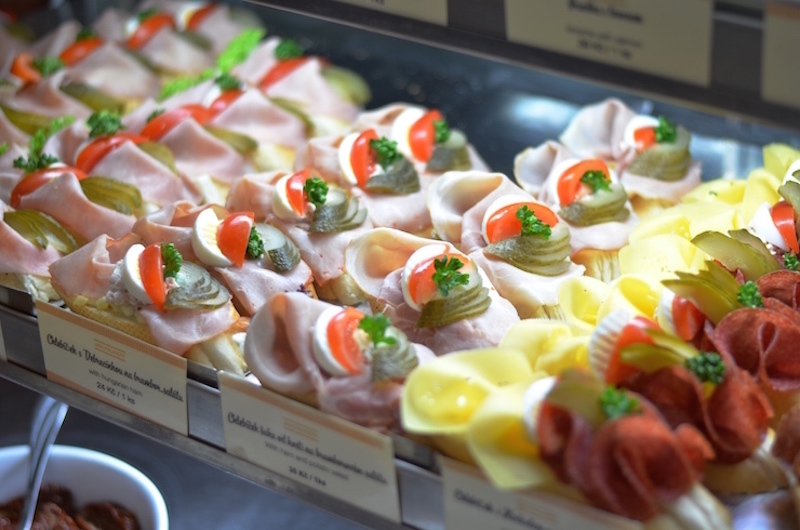 That is another important point about chlebíčky: obložené chlebíčky are not only meant to be delicious, but beautiful too. 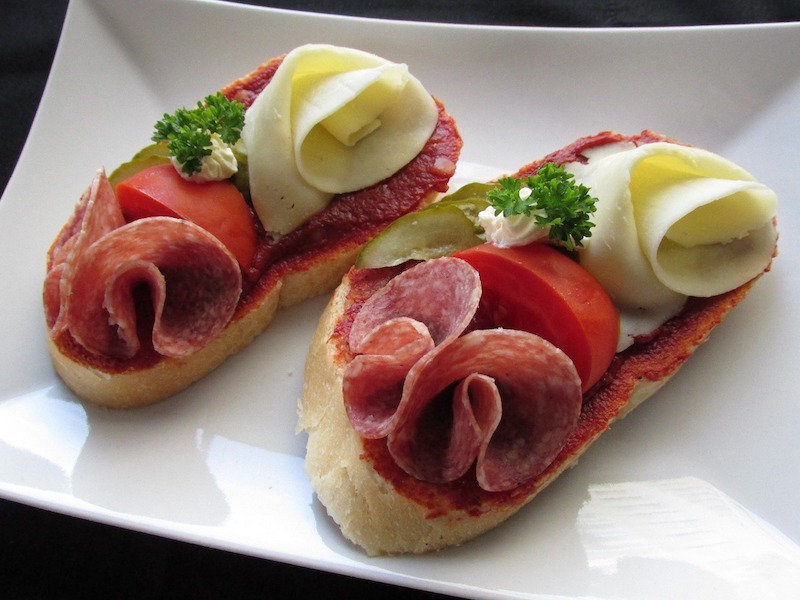 The presentation and arrangement of ingredients on the chlebíček is of the utmost importance. 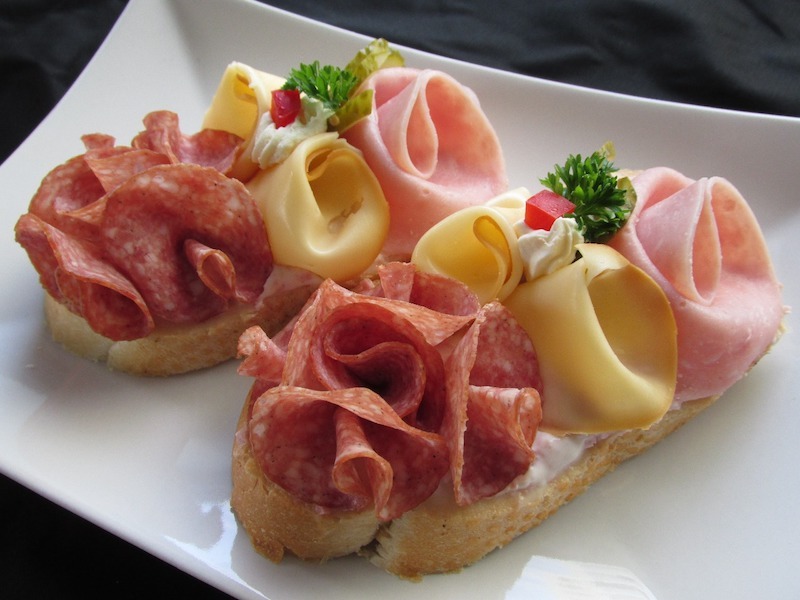 The garnishes are often arranged to create harmonious designs and man Czech people take pride in making their chlebíčky both tasty and pleasing to the eye. 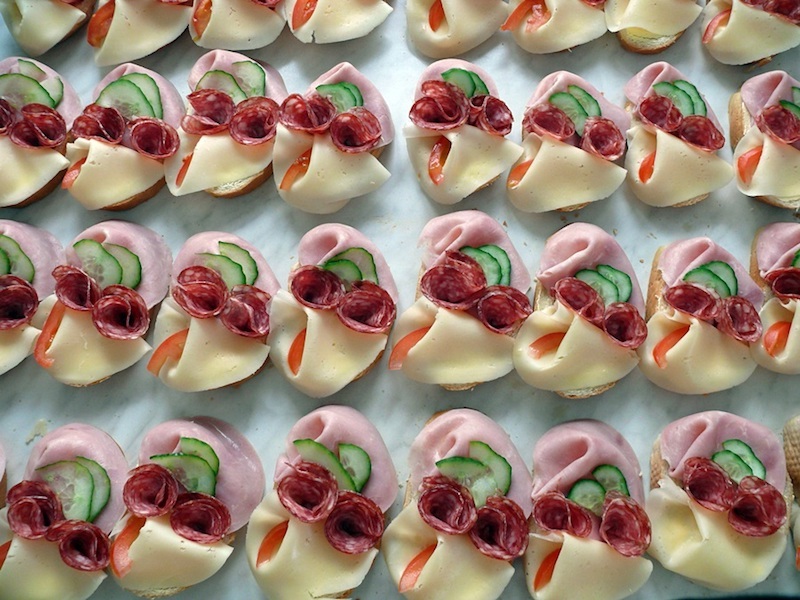 Not only are they delicious, they are also pretty to look at. 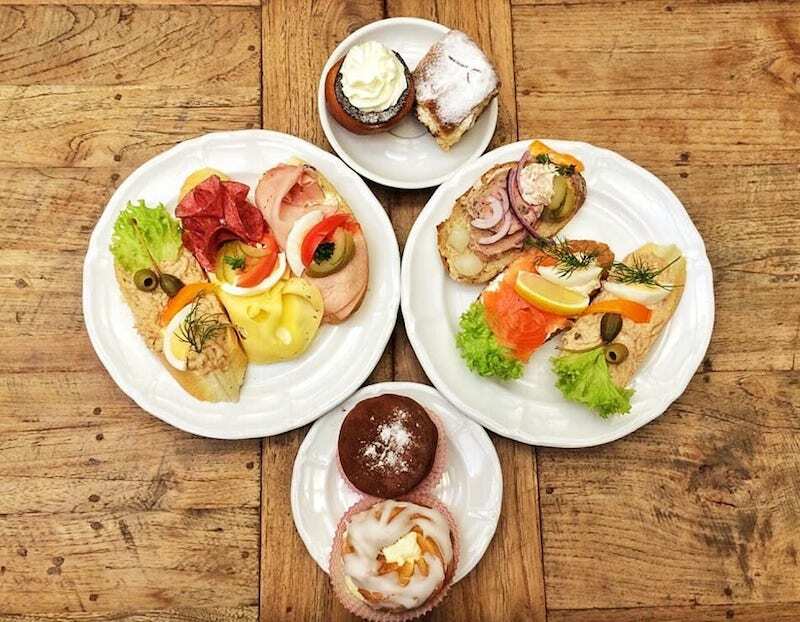 If you would like to see photographs of the various styles of Chlebíčky, you should check out our post Delicious Obložené Chlebíčky of Instagram.